Hanging out with Gorman Thomas at "Gorman&apos;s Grill," circa 1995. Published Oct. 3, 2018 at 7:02 p.m. This isn't a column about how much better we had it in the old days. No, this is a piece about what it was like being a Brewers fan when the franchise was down in the dumps, when County Stadium was empty and the playoffs were absolutely out of the question, year after year after year. Even breaking even was unthinkable until 2005. I'm not picking on millennials, who are great fans of this emergent team. It's not your fault you aren't old like me at 44. You just didn't have to sit through the era that included duds like Matt Mieske, Sean Berry and Jose Hernandez. You didn't have to root for Ronnie Belliard, Lyle or James Mouton, or David Hulse. Consider yourself lucky, because I did. 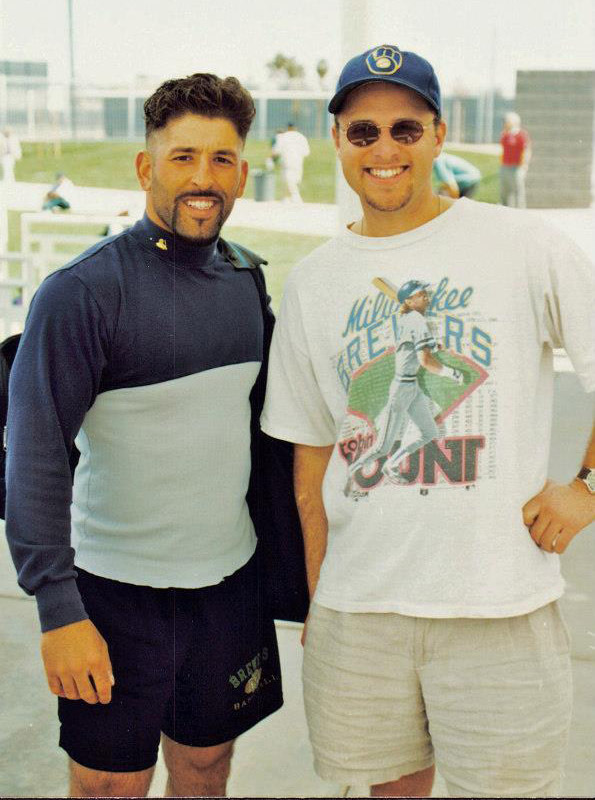 I became a Brewers lunatic fan in 1993 at the age of 19. Before that, I was a kid who liked the Crew, who remembered the '82 World Series, but as a teenager on the East Coast, didn't have much access to the team. Only as I came back to Milwaukee for summers during college, did I start to rekindle my love for the Brewers. 1994 was the year the Brewers retired the best logo in sports in favor of that hideous Notre Dame-inspired M and B. I saw an exhibition game at RFK Stadium in Washington that spring, the first season after Robin Yount retired. I scoured the box scores in the Washington Post, familiarizing myself with the stats of John Jaha and Graeme Lloyd. I waited through SportsCenter, but they rarely even mentioned Milwaukee. That would have to do until I moved back to the 414 in 1996. But then, it was game on. 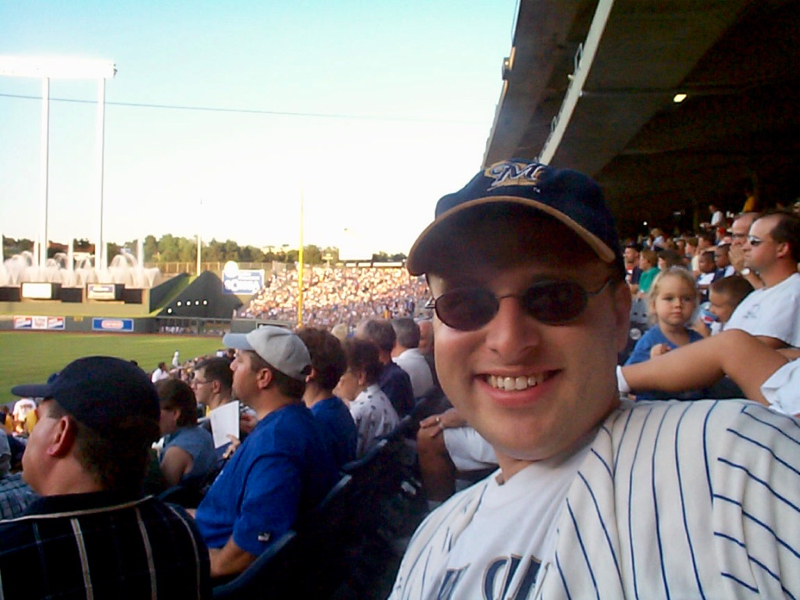 With the youthful enthusiasm and ample free time of a 22-year-old, I went to tons of games at County Stadium. We'd buy cheap tickets then sit wherever we felt like, because a Tuesday night game might boast a paid attendance of 9,000 (which was generous). I listened to every other game on the radio, or watched them on channel 24. I went to a "build it now" rally for Miller Park, and inexplicably wrote a letter to Bud Selig asking him to invest more into the franchise. I road tripped to Cooperstown to see Robin Yount inducted in the Hall of Fame. I took a vacation to Kansas City to watch the Brewers on the road. The teams were horrible, and it was glorious. We made it our mission to buy up all the old logo stuff we could find. We scoured thrift shops and sporting goods stores for discontinued hats and boxer shorts. I bought a very small pair of Brewers baseball pants at a place on Bluemound, as the owner scowled at me for trying on them on in the dressing room, barely squeezing myself into this ridiculous outfit. 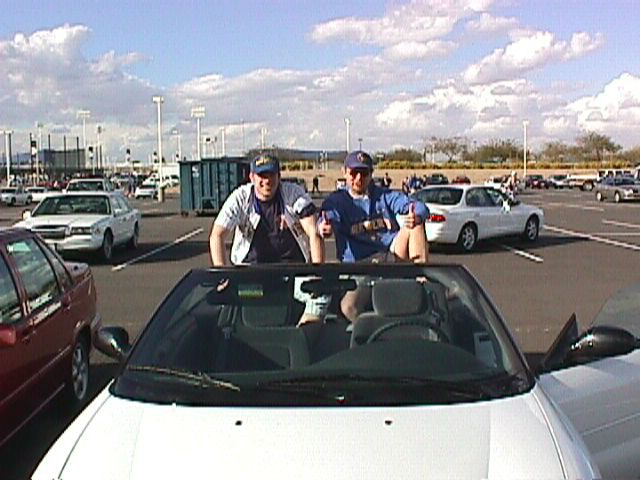 In 1998, I started my annual tradition of going to spring training. I went every single March through 2015. 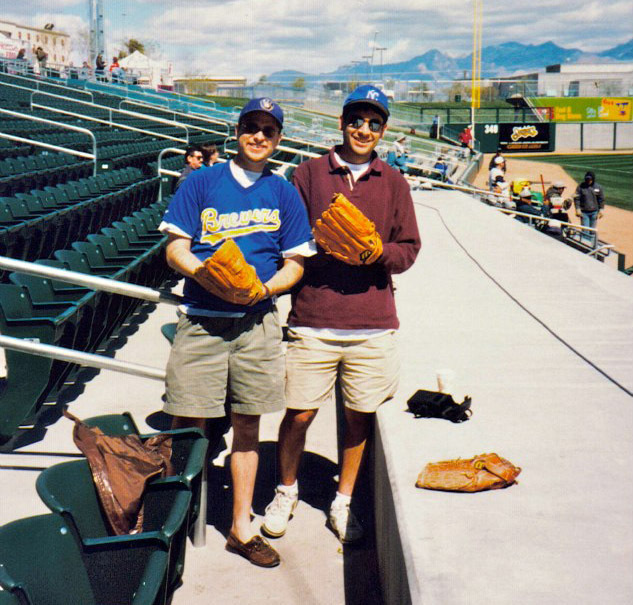 I also started OnMilwaukee that year, and received my first press pass for County Stadium in 1999. They served free beer in the press box, but I was too nervous to pour myself one. Mostly, I just sat on the catwalk by myself in front of Bob Uecker and Jim Powell and scored games while learning the ropes. Sitting there was an amazing experience, because I could listen to Uecke and Jim (who eventually became my real-life friend) live, without a radio. I once heard Powell say that baseball will hold your hand for seventh months. He was exactly right. 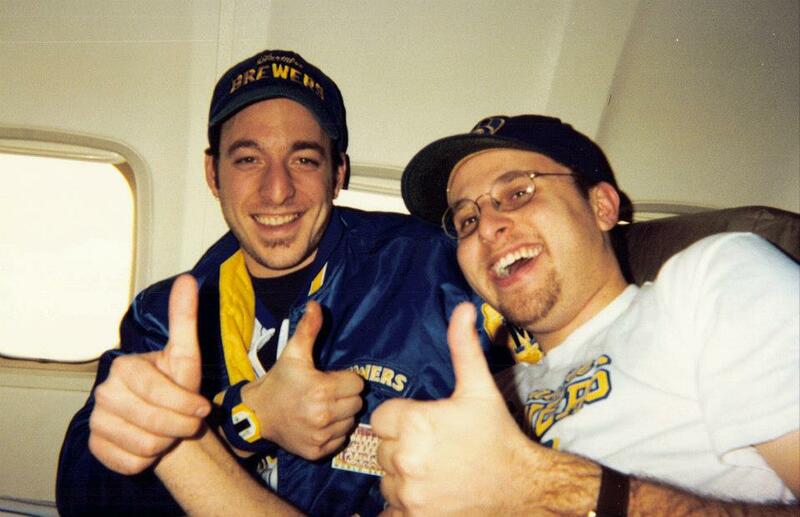 The Brewers were practically my touchstone back then. Everyone else cared more about the Packers (who I also loved), but baseball was an every-day passion from hopeful March through woeful September. Looking back, I wonder how I devoted so much time and energy to the Brewers. Where did I get the money to buy all the Brewers stuff on eBay? Did people think I was weird for being so obsessed, for buying a Brewers baby onesie even though I didn't have a child? Probably, but if there's a time in your life to go all in on baseball, it's your twenties. No wife, kids, mortgage payment – it leaves a lot of time to be a fan. I hated all the bad baseball decisions by the front office, like signing Jeffrey Hammonds and trading away Greg Vaughn, B.J. Surhoff and Jeff Cirillo, but I always believed. It's like it didn't even matter that these teams never had a chance. I still cried at the last game at County Stadium after tailgating for about six hours. So now, when I see Miller Park sell out, and I watch fans wear the ball and glove logo like it never went away, my only emotion is … happiness. Principal owner Mark Attanasio breathed new life into this franchise. Even despite the great inequities in MLB that make it so unlikely for a team like the Brewers to compete, they have managed to build a great young team. It's nothing short of amazing. Milwaukee deserves to celebrate right now, no matter how deep the Brewers go in the playoffs. They'll be competitive now for years. We've come a very long way from those dark days in the '90s and early 2000s.